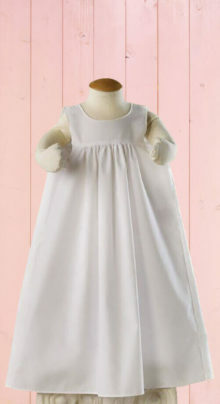 Beautiful organza dress with matching bonnet, blanket and bib. 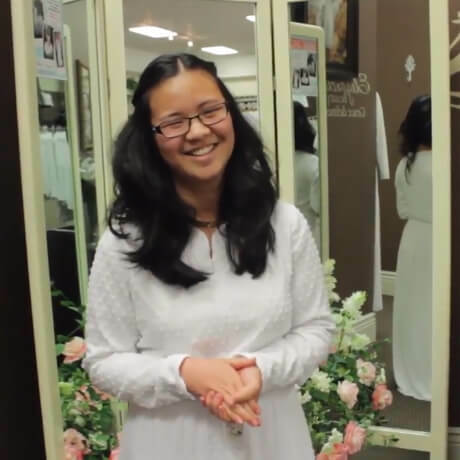 So sweet with long sleeves, delicate lace on bodice and matching satin trim. Polyester and Polycotton. Soft, crinkled lace over satin and tulle makes this a s yummy as cotton candy. 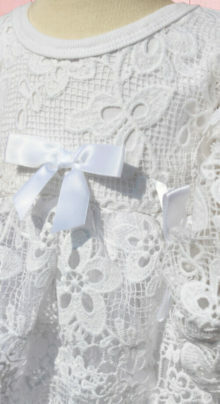 Organza sash is accentuated with lace and satin flower and ties in the back. *100% Polyester *Hand wash/drip dry. *Made in USA *Sizes: XS-up to 3mos. Can you say, “Cutest little bug, ever? 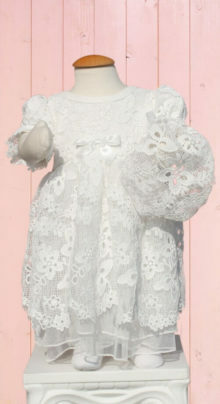 !” Sweet, crocheted flowers over two layers of soft tulle and a cotton jersey romper. 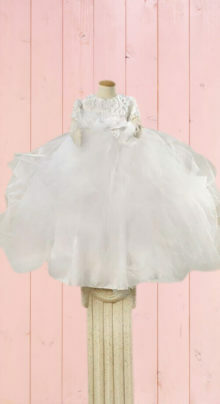 Legs snap close and create adorable ruffles at the feet. Ribbon tie in the back matches ribbon bows on each sleeve. Matching hat with elastic edge and bow. Oh yes. This will become a family heirloom. Two layers of tulle with rose and vine appliques cover a soft jersey knit dress. Flower trim accentuates the neck, waist and sleeve trim. 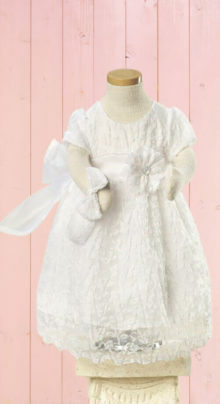 Ties in the back with match bows on the sleeves and perfectly adorable hat with gentle elastic banding. 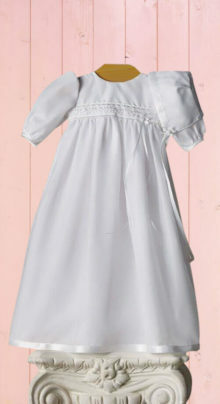 Just makes you want to hug the precious little babes whether it’s worn for a Blessing dress, Baptism or Bridal party. *Cotton and polyester. *Hand wash/drip dry. Sizes: NB, 3mo. 6mo. 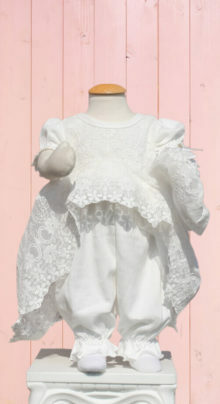 Sweet lace embroidered with an English Garden covers a soft cotton jersey bodice and bloomers that snap around the ankle creating a delicate ruffle at the feet. Delicate sheering on the shoulder sleeve and around the arm is finished with a row of sunflower lace. Ties in the back and comes with a coordinating hat with light-weight elastic and a tiny row of shimmer that produces just a hint of sparkle for perfect pictures. If not for the Blessing or Christening, then definitely for the party afterward. *Hand wash/drip dry. Sizes: NB, 3mo. 6mo. 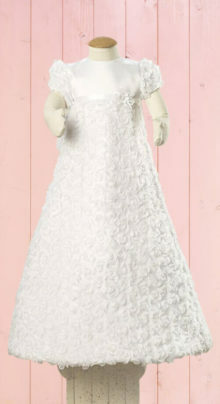 Sweet, fully-lined lace bodice with sheared empire waist, button back with clap sleeve. 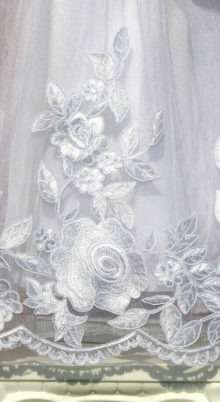 Skirt is fully-lined organza. 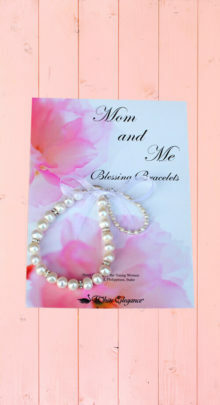 Perfectly chosen satin ribbon and flowers finish the graceful look. 100% Polyester. Carefully hand cut pieces of soft tulle are attached layer upon layer to a ribbon appliqued lace bodice to create this breathtaking infant dress. Fully lined with a zipper back. Plan on taking dozens of photos of your baby in this amazing work of wonder. 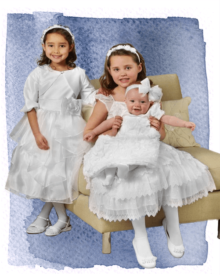 Don’t forget a soft baby Blessing or Christening slip to protect the little one from scratchy seams, fabric and trims. 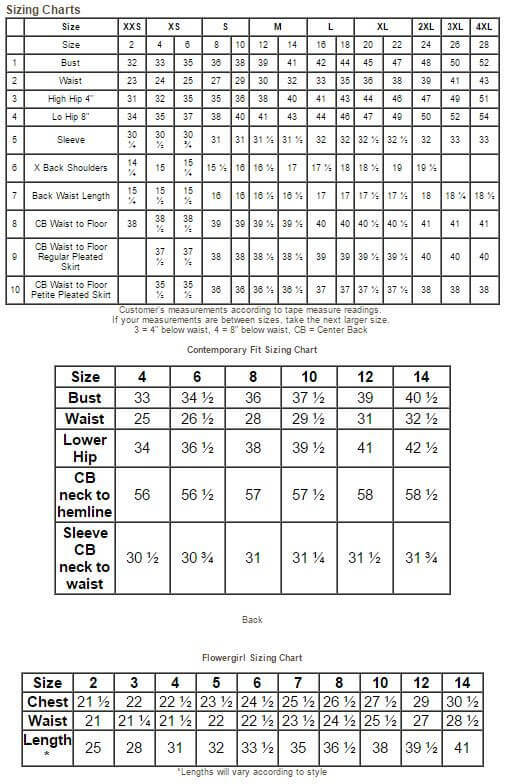 Three button back closure. 100% Cotton. *100% Cotton *Hand wash/drip dry *Sizes: NB, 3 mo., 6 mo., 12 mo. 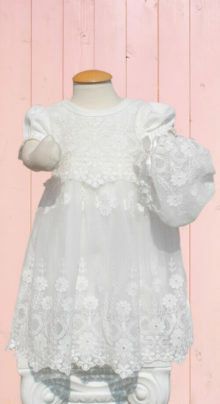 Three dimensional embroidery of organza lace embellishes the sleeves and skirt of this adorable, contemporary dress. Three button back closure with satin ribbon and small flower finish the empire waist. Lined in poly satin. 100% Polyester. *100% Polyester *Hand wash/drip dry *Made in USA *Sizes: NB, 3 mo.